Uberplay Entertainment announced today that they are ceasing operation effective immediately. I’m bummed. I’ve been part of a small company that has folded and I know that it’s depressing after putting your heart and soul into something like that. I wish them well in any future endeavors and I’m sad it didn’t work out for them. 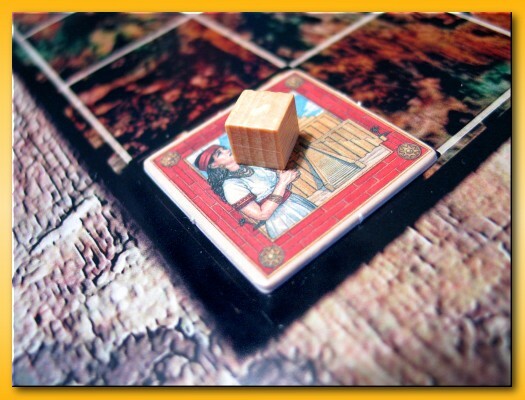 The print for the board of the ‘Nile’ 2-player variant of Tigris & Euphrates arrived today from CafePress. The custom large poster comes 23″ x 35″ but the board artwork prints only 17″ x 20″ centered. I trimmed the white border off the poster and I’d like to mount it but I think I’ll wait. I’m not satisfied with the color scheme. The biggest change that I think I need to make is to adjust the hue of the river. I think it’s too green given the color of the blue tiles. Also, the board is relatively dark so I may make some minor adjustments to that as well. I must say, though, that the tiles do have a certain degree of visual pop making it easy to detect patterns without being hindered by the artwork. I’ve recently gotten T&E back to the table several times after a long hiatus and I’ve been having a lot of fun with it. I’ve wanted to introduce the game to Lisa but I wanted to play the game on a smaller board where there would be more competition for kingdoms. In my opinion, T&E’s shines when you’re challenged with working through how conflicts will be resolved and the size of the official 3-4 player board just doesn’t force enough conflict. 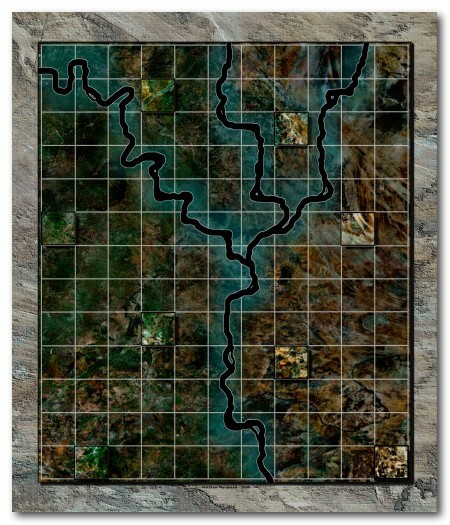 So, I dug through the BGG files for T&E and found the 2-player Nile Variant board that had gotten good reviews for the layout. I was all set to attempt to print the board but then decided that the artwork just wasn’t doing it for me. I figured if I was going to pay to have it printed on poster paper, or canvas, or some such thing, I might as well spend some time seeing if I could come up with some artwork that I liked better. So, below you can see what I came up with and I ordered a custom larger poster print from CafePress. It should come next week so I’ll post an update with the results. It looks like the storms in Texas may have brought down Board Game Geek. It’s been unavailable since some time during the night. It might prove problematic to get it back up and going in the near future because Aldie is here in Columbus at Alan Moon’s invitation only yearly “Gathering of Friends” for the next week or so. Aldie does a lot of hands on management of the equipment as his full-time job so it’s not like there are teams of people ensuring that the site is functioning properly. Ah, well. If you were wishing to participate in my “name the game” contest I apologize. It’s bad timing but it’s out of my control. You could always browse the store and buy something while you wait for BGG to come back up :-). Update: Aldie posted in Google Groups that he’s aware of what’s going on and it looks like it’s an ISP issue. 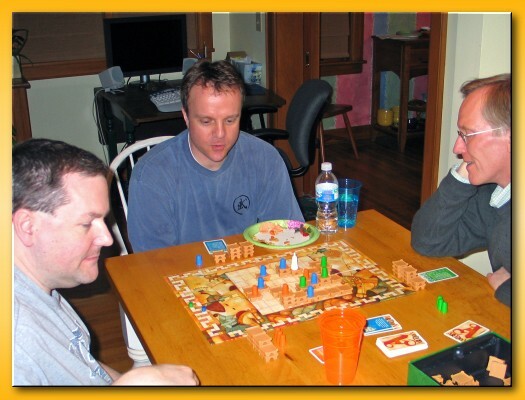 We met at my house for the April 2008 edition of Analog Game Night. I thought it was going to be a big crowd but at the last minute we had three cancellations so we ended up with a total of six. With six we usually split into two tables so Bob, Rich, and Paul moved to the kitchen table and got started on Torres. Torres, the so-called 4’th game of the Mask “Trilogy” has passed its prime for me. I’ve played it approximately twenty times since I purchased it and I can’t see myself ever requesting to play it again. It’s not a bad game per se but most of the fun I felt was there originally has leaked out somewhere along the way. The game is a rather methodical exercise in figuring out how to move your knights up, down, around, and through the maze of castles to grab the highest positions on the tallest towers. The king’s bonus and the action cards attempt to spice up the game but in the end, everyone is just trying to figure out the abstract puzzle. While Torres was getting started on at the kitchen table, Jason, Tim and I set up In the Year of the Dragon in the dining room. This was our first play of “Dragon” and I must say, I was impressed. The first game is always a learning experience and I wish I could always play a new game two or three games back to back to help solidify my thoughts but, alas, that never happens. I made a horrible, horrible blunder on the last turn and miscalculated the effect of the final event of the game: ‘taxes’ (or whatever it’s officially called). I cannot say that I misunderstood that you lose a person for every yuan you cannot pay but I had a major “brain fart” and thought that I would only lose one person. Instead, risking an earlier payment to perform the same action as another player and paying 3 yuan, I had no money when the last event occurred and losing four people totally devastated my palaces. I also took a rather painful hit when decay set in before the round scoring as well. In the end, my final scoring dropped from respectable to downright pitiful. On the good side though, I learned my lesson! Few games capture my desire to play again immediately and Dragon did it. I even found my heart pounding wildly a couple of times during the action selection phase just hoping my opponents wouldn’t choose the option I wanted. The game is a little tough to describe and it takes a bit of effort to get through the rules for new players so I recommend that teachers practice streamlining the process as much as possible. 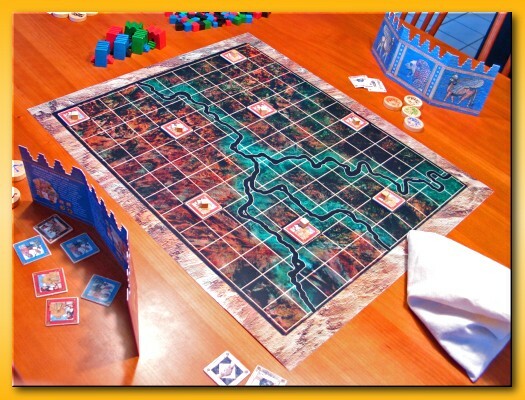 The game bits comprise a board with two tracks: the victory point and the person tracks, stacks of ‘people’ tiles in various forms (e.g. farmers, doctors, warriors, scholars, tax collectors, etc. ), action tiles (9), palace ‘floors’, coins (yuan), privileges, rice tiles, fireworks tiles, individual players cards (11 cards each), event tiles (12 – one for each month in the Year of the Dragon), and a few more minor bits that don’t play a major role in the game. Lots of bits! Player win by advancing the farthest on the victory point track by game end. Players score victory points throughout the game but there are 12 specific scoring opportunities (once per round where each round represents a month in the Year of the Dragon) and a single end-game scoring based on the items in your personal playing area. At a high level, players need to build palaces in their personal play area by choosing the ‘build’ action to obtain palace floors (max height of three). They then must populate those palaces by obtaining people and assigning them permanently to a palace (no more than the height of the palace). At the end of every month, an event occurs that is usually pretty damn brutal and you must obtain items in earlier rounds in anticipation of protecting yourself from the event. For example, when drought hits you lose rice tiles for each palace you have and when you run out of rice tiles…the people in your palaces that you’ve worked so hard to get there start dying. Yikes! So, how do you get stuff and how do you make it pay off while protecting yourself from the bad stuff? Each round/month is divided into four phases: Action, People, Event/Decay, and Scoring. In the Action phase, the nine Action tiles are shuffled and divided into piles that equal the number of players. The position of your token on the person track determines the turn order (farthest ahead to the farthest behind). In person track order, players select a group of action tiles and take one of the actions depicted on one of the tiles in the group. The actions tend to allow the player to garner victory points, firework tokens, rice tokens, money, advance on the person track, build palaces/floors, etc. You are allowed to choose any group of actions but if another player has already chosen that group you have to pay 3 yuan to the bank. 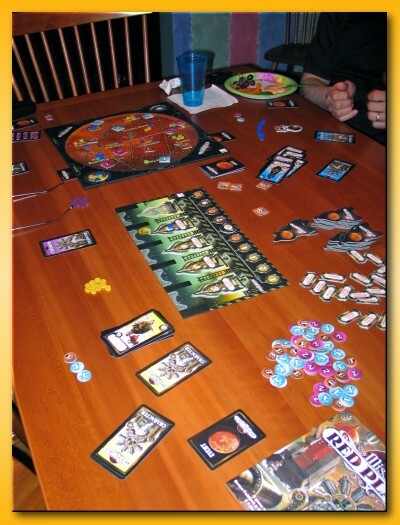 Once actions are complete, players select a card from their individual decks of 11 cards (9 person and 2 wild cards) allowing them to choose one of the 9 types of people from the top edge of the board. You do not get your cards back so choose your people wisely. The chosen person must be assigned to a specific palace in front of you. The people in your palaces tend to adjust the payoff of choosing a specific action the following round. For example, if you choose a ‘rice’ action, you get a rice tile for the action plus rice tiles for any additional farmer tiles you have in your palaces. So you must think a few turns ahead of when you’ll need an item since it may take two rounds to establish the necessary payout. For every person tile you choose you get to move ahead the indicated number on the person track. 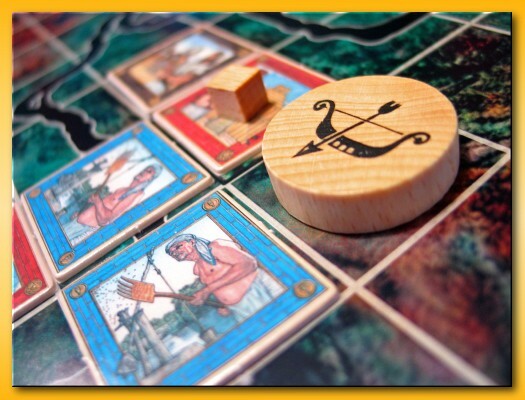 Some of the person tiles trigger a larger payout but move you ahead a smaller number. Which person tile you choose can be different in different situations depending what compromises you need to take to affect the change you need. After people selection is complete, the event for the month occurs. The events are lined up across the bottom side of the board so you can anticipate what will happen and in what order throughout the entire game. The first two months are peaceful (no event) but the following 10 months can be hell. There are sickness tiles which cause you to lose 3 people unless you posses doctors in your palaces to mitigate the plague. There are drought tiles that destroy your rice tiles and people if it comes to that. There are Mongol hoards which attack and alter the victory point track, there are tax tiles that cause you to pay 4 yuan to the bank and they kill some of your people if you can’t pay. The only good tile is a bonus for having the most and second most number of fireworks tiles. A small respite amid the trauma of the event track. If that wasn’t enough, after the event, decay sets in and destroys a floor of every unoccupied palace. And then, luckily round-end scoring. 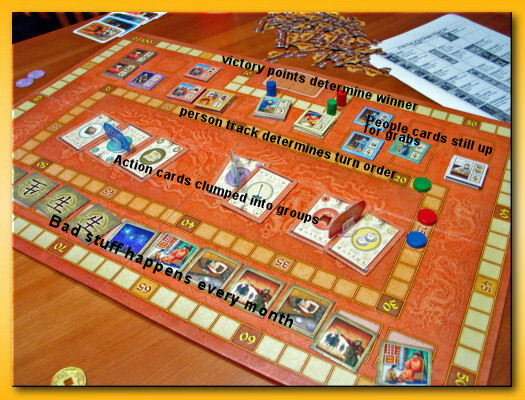 After 12 rounds, there is a final scoring based on the number of people you managed to retain by game end, the bonus for placing monks in larger height palaces, and the conversion of rice/fireworks tiles into money and then money into victory points. All in all, I loved the game. I can see that it might get a little methodical and repetitive but the randomness of the 12 events on the event track and the randomness of the way the action cards clump up will hopefully keep the game alive. In any case, I’m going to have fun trying to get tired of it. Jason and Paul left after the first round of games and the four of us played a round of Mission: Red Planet. I had a much better handle on the use of the cards this time and felt like I at least finished a respectable second. M:RP is a fun romp and can’t be taken too seriously. I’m enjoying it as a ‘closer’ and still look forward to more plays. Whew! I apologize for the long winded post but it just had to come out. Thanks everybody for coming and I look forward to next game night. From this article on BoardGameNews, up until yesterday, Hasbro didn’t own the rights to Trivial Pursuit. Instead, over the past twenty years, Hasbro has been paying licensing fees to the original publisher Horn Abbot (owned by the two designers Chris Haney and Scott Abbott and two other lucky dogs). But, as of yesterday, Horn Abbot sold all rights to Hasbro for….wait for it…. eighty “holy mother of all that’s sane in this world” million dollars. Yes…that’s an ‘m’ before the ‘illion’.